Last week, my husband packed Moo Goo Gai Pan with Pan-fried noodles for my lunch box. OMG! My colleagues were so jealous and they said they never saw this before in Chinese restaurant. Well, if you really want to try some authentic Chinese food, do some research and find some really authentic places; or if you want to save some money, just follow the recipes at Yzenith.com. We try to make every recipe as user-friendly as possible. 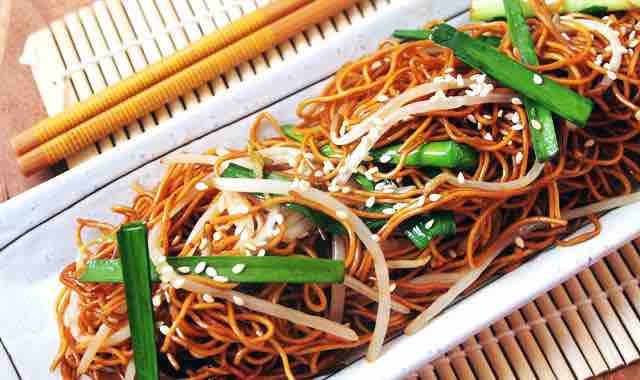 This is a very easy, everyday traditional Chinese food recipe for pan-fried noodles. It will take just about 10 minutes, I promise:) My husband and I both work full time, so we understand the challenge of cooking at home. We are constantly in a battle with time, and we rarely win. Huh……until we realized Pan-fried noodles is such a simple and healthy recipe. So we decide to share with everyone. Honestly, I am not a big fan of noodles. If you know someone from China, they may tell you whether they like noodles or rice depending on which part of China they are from. My husband is from the Northern China, so he is always so passionate about N-O-O-D-L-E-S! When it comes to flour-based products, he is the Executive Chef! Depending on his mood, he may also add additional stuff, like shrimp, egg, onion, or carrots to the original recipe. I just love the color and the taste! We are here to help if you have any questions! We are food lovers and hope you will like our blog! Use boiled water to cook noodles for about 2 minutes. Remove noodles to a separate container and let it dry. Heat up the pan and stir-fry the garlic. Sprinkle some sesame if available. Don’t boil the noodles for too long. Keep 2 minutes a max. Add any ingredients you like. This is an easy-to-customize recipe.